Why do we remember certain things, like the scary music from the movie Jaws, but forget others, like the name of that theory we learned in economics class years ago? Why is it easier for some people to remember an urban legend about missing kidneys than a concept they studied in the college or university classroom? Why do some ideas “stick” while others are just as easily forgotten? 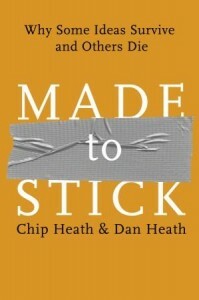 Using practical examples that tap into the cognitive and affective domains, the book explains how to make ideas from any discipline “stick” in a multitude of contexts. “Piquing curiosity is the holy grail of teaching. Cialdini said, “You’ve heard of the famous Ah ha! experience, right? Well, the Ah ha! experience is much more satisfying when it’s preceded by the Huh? experience… Movies cause us to ask, What will happen? Mystery novels cause us to ask, Who did it?. . . Unexpected ideas, by opening a knowledge gap, tease and flirt. They mark a big red X on something that needs to be discovered but don’t tell you necessarily how to get there” (pg 4, Teaching That Sticks). This entry was posted in Book Reviews, Instructional / Course Design, Instructional Strategies by Kim West. Bookmark the permalink.